The Curlew exists not only to promote fine writing and illustration in order to inspire people about the natural world, but also to support conservation. Below are a few organisations that The Curlew is currently supporting through sales and will support in the future. Founded in Namibia in 1990, Cheetah Conservation Fund (CCF) is the global leader in research and conservation of cheetahs. CCF is dedicated to saving the cheetah in the wild. The vast majority of wild cheetahs are outside protected areas, in areas populated by humans. Saving this magnificent animal from extinction requires innovative conservation methods that address the welfare of both cheetah and human populations over large landscapes. The Curlew made a donation to help their good work. The Trust was set up in the 1990s to provide advocacy and education to the public as well as breed and conserve rare and endangered native species of animals and birds of New Zealand– in particular all species of Kiwi.. The Trust's vision is to ensure through its Kiwi breeding programme that Kiwi populations reach a sustainable level in the wild. The Curlew made a donation to help them do this. WPSI is one of the most respected and effective wildlife conservation organisations in India. WPSI's main aim has been to bring a new focus to the daunting task of tackling India's growing wildlife crisis. It does this by providing support and information to government authorities to combat poaching and the escalating illegal wildlife trade, particularly in wild tigers. It has now broadened its focus to deal with human-animal conflicts and provide support for research projects. The Curlew:Pinus made a donation to help this valuable work. The Wildfowl & Wetlands Trust is a conservation charity that saves wetlands, which are essential for life itself. Wetlands are the primary source of drinking water for people and wildlife. They also connect us with nature, and with ourselves, through beautiful landscapes and inspiring encounters with wildlife. The Curlew was launched at Slimbridge, the award-winning WWT reserve set up by Sir Peter Scott, with sales in the gift shop of Quercus supporting the work of WWT. Our Vision: A sustainable future for the planet, where biodiversity is effectively conserved by the people who live closest to it, supported by the global community. Our mission: To act to conserve threatened species and ecosystems worldwide, choosing solutions that are sustainable, based on sound science and take into account human needs. The Curlew: Fraxinus made a donation to help stop elephant poaching. The John Muir Trust is a charity that was founded in 1983 to conserve and protect wild places with their indigenous animals, plants and soils for the benefit of present and future generations. The Trust takes its name and inspiration from John Muir, the Scots-born founder of the modern conservation movement. Muir was passionate about wild places. He explored them, wrote about them and campaigned to protect them. Like Muir, the Trust believes in protecting wild places – for their own sake, and for the wellbeing of people and wildlife. The Trust works to defend wild land, enhance habitats and encourage people of all ages and backgrounds to connect with wild places. The Curlew: Pinus, which has an essay by John Muir, made a donation to help with this work. The National Geographic Society is a nonprofit scientific and educational organization that pushes the boundaries of exploration to further our understanding of our planet and empower us all to generate solutions for a more sustainable future. The society funds researchers such as Tatjana Rosen, who is working to protect snow leopards in central Asia, which are particularly at risk of retaliatory killings. There are few wildlife protections in the region to mitigate the problem. So far, Tatjana and her team have built more than 120 predator-proof livestock enclosures that are keeping livestock and snow leopards safe. The Curlew: Populus, made a donation to help continue this work and save the snow leopard from extinction. IFAW's vision is a world where animals are respected and protected. IFAW staff rescue individuals, safeguard populations, and preserve habitat. The work connects animal welfare and conservation, demonstrating that healthy populations, naturally sustaining habitats and the welfare of individual animals are intertwined. Founded by the wildlife artist David Shepherd, the David Shepherd Wildlife Foundation is a highly effective wildlife conservation charity funding key conservation projects across Africa and Asia. Its mission is to increase awareness to people around the world about the need to protect and conserve wild animals and their habitats. It funds conservation projects across Africa and Asia that fight wildlife crime, protects natural areas and engage local communities in finding long-term, sustainable solutions to protect their native wildlife. It also campaigns for stronger laws and protectionist policies for wildlife and fund investigations to expose the illegal trade in endangered species. The Curlew: Alnus, which featured some drawings by David Shepherd, made a donation to the Foundation. This project (see pic above) supports several small schools in and around Kampala, Uganda. The public school system in Uganda is broken, so the only chance that children really have of acquiring an education is to find a place in a private school. These schools are not the same as in the UK or USA; elitist establishments only for the rich. The cost, for example, to pay for an education for one Ugandan child for one year is £75. At present, Infancia Uganda is a paying for 28 children. The project is small, with 100% of the money collected going directly to the school. 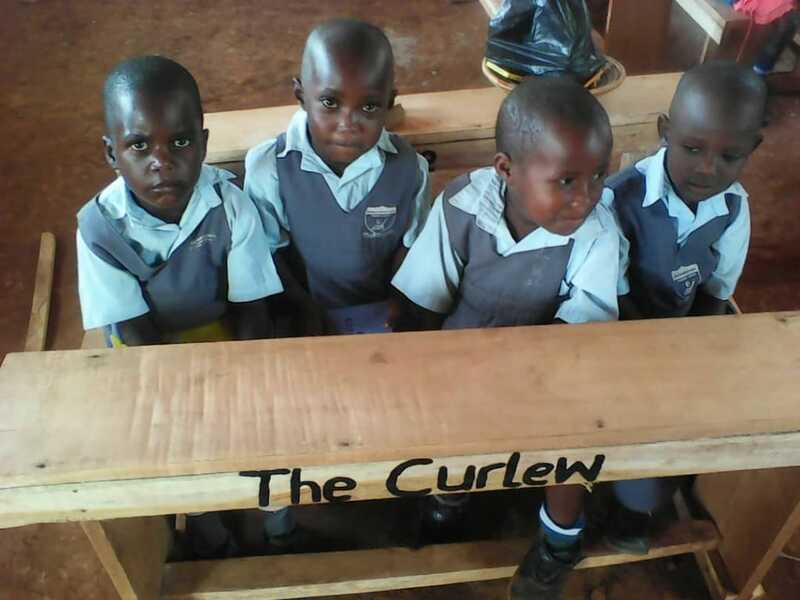 The Curlew: Fagus made a donation to buy a student desk for one of the supported schools, and sent copies of The Curlew to help inspire the children. The Curlew: Betula helped provide school supplies. The Born Free Foundation is a dynamic international wildlife charity, devoted to compassionate conservation and animal welfare. Born Free takes action worldwide to protect threatened species and stop individual animal suffering. Born Free believes wildlife belongs in the wild and works to phase out zoos. It rescues animals from lives of misery in tiny cages and gives them lifetime care. The Curlew: Populus made a donation to help with this valuable work. International Animal Rescue works with local people to save animals around the world from suffering. Wherever possible, IAR returns rescued animals to their natural environment, but it also provides a permanent home for animals that can no longer survive in the wild. Using scientific research, IAR also works to educate the public in the compassionate and humane treatment of all animals, and works with other like-minded organisations and government departments to strengthen legislation to protect animals from cruelty and neglect. The Curlew: Aesculus made a donation to the IAR Bear Rescue Project. Friends of the Earth campaign on today’s most urgent environmental and social issues. They challenge the current model of economic and corporate globalization, and promote solutions that will help to create environmentally sustainable and socially just societies. The Curlew: Acer made a donation to the UK FoE Save the Bees campaign to help count and protect bees. The Trust operates 50 projects in 18 countries around the world. The Trust focuses on islands, where unique species are under immense pressure, and on animal groups suffering the worst declines, such as primates and amphibians. Trust staff manage breeding programmes for release back to the wild; develop the skills and tools to conserve species in the wild; train others in animal husbandry and conservation practice; and communicate important messages to visitors. The Curlew: Crataegus made a donation to the Rewilding Islands project, to help restore Floreana in the Galapagos and Round Island in Mauritius. The mission: To protect the natural environment for the long term through acquiring and preserving interests in or associated with land or water that's of high conservation value or environmental significance. And to preserve, restore or maintain the conservation value or environmental significance of the natural environment through the planned management of Bush Heritage’s property. The AWC's strategys is to establish sanctuaries by acquiring land and through partnerships with landholders; and to implement practical land management – feral animal control and fire management – informed by good science. Brooke is an international animal welfare charity working to improve the lives of working horses, donkeys, mules and the people who depend on them. The goal of the Nature Conservation Foundation is to contribute to the knowledge and conservation of India’s unique wildlife heritage with innovative research and imaginative solutions. It works in a range of wildlife habitats, from coral reefs and tropical rainforests to the Himalayas, researching the survival needs of endangered species such as the snow leopard, as well as equally fascinating but lesser-known wildlife such as corals and spiders. The foundation's research also addresses human resource use and its impacts on wild species and ecosystems. WWF's ultimate goal has always been “people living in harmony with nature” - so its work is about respecting and valuing the natural world and finding ways to share the earth’s resources fairly. TRAFFIC, the wildlife trade monitoring network, is the leading non-governmental organization working globally on trade in wild animals and plants in the context of both biodiversity conservation and sustainable development.